Bring oats to the lunch or dinner table with this savory baked oatmeal filled with sun-dried tomatoes, baby spinach, and creamy goat cheese. I was compensated for writing the original article, “Oatmeal For Dinner,” and developing the recipe found in the February 2016 issue of Today’s Dietitian. I was not compensated for sharing the column or magazine with readers on my blog. All opinions are my own. Oatmeal is one of my favorite breakfasts during winter months (although I’ve been known to have it in the summer too!). The most basic way I make my oatmeal on a regular basis is by combining 1/2 cup quick 1-minute oats with 1 cup skim milk, and microwaving at 70% power for 1 1/2 to 2 minutes, stirring halfway through. I switch up the toppings depending on the season and my mood – pears, apples, and oranges in the winter, berries in the summer; a swirl of peanut butter or raw chopped pecans. Sometimes I even make my oatmeal with kefir, which gives it a tangy end product, or cottage cheese, which leads to a more savory and gooey bowl of oats. Overnight oats are all the rage these days, and while I like them, my go-to for oatmeal is a hot bowl (although I do like prepping breakfast the night before!). Baked oatmeal, on the other hand, I can get behind all the time. These Ricotta Berry Oatmeal Cups are a huge hit in my house, especially for school snacks and as a really easy grab-and-go breakfast option on those busy mornings we’re rushing out the door. I’ll also make a sweet version of baked oatmeal in a pie or casserole dish on weekend mornings as a change of pace from pancakes or French toast, or I’ll make one for the school/work week when I’m doing Sunday meal prep. 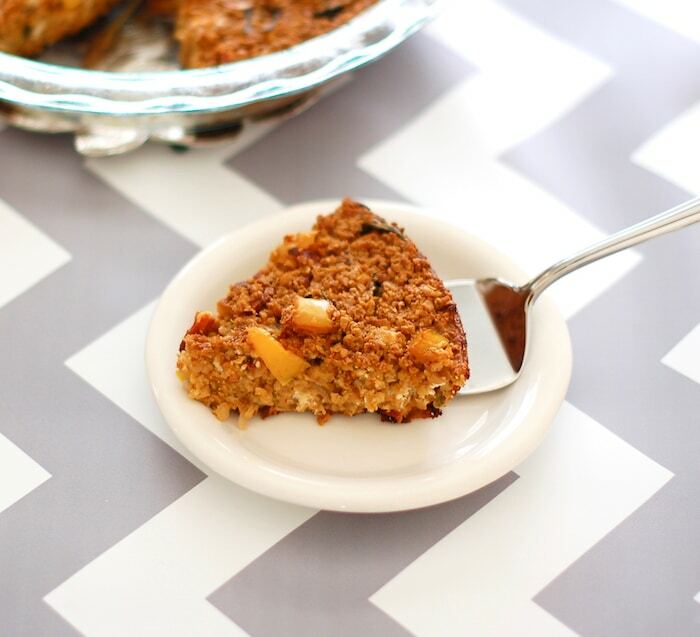 My Pumpkin Spice Baked Oatmeal is a hit in the fall! Another trend that’s been showing up lately is savory oatmeal bowls. These work for breakfast, especially if you don’t have a sweet tooth, but I actually like making them for lunch or dinner. Years ago I combined the two trends – baked oatmeal and savory oats – for an article and recipe I shared in Today’s Dietitian Magazine in honor of February’s Heart Health Month. I chose to write about oats since they are an extremely heart-healthy food thanks to their fiber content. There are many more health benefits to oats, including anti-inflammatory and anti-cancer properties as well as gut health benefits, all of which you can read about in my article. My kids were bewildered when I told them we’d be having oats for dinner—but why not? Breakfast for dinner is quite popular and fun for families, and oatmeal should be no exception, especially given all its health benefits. 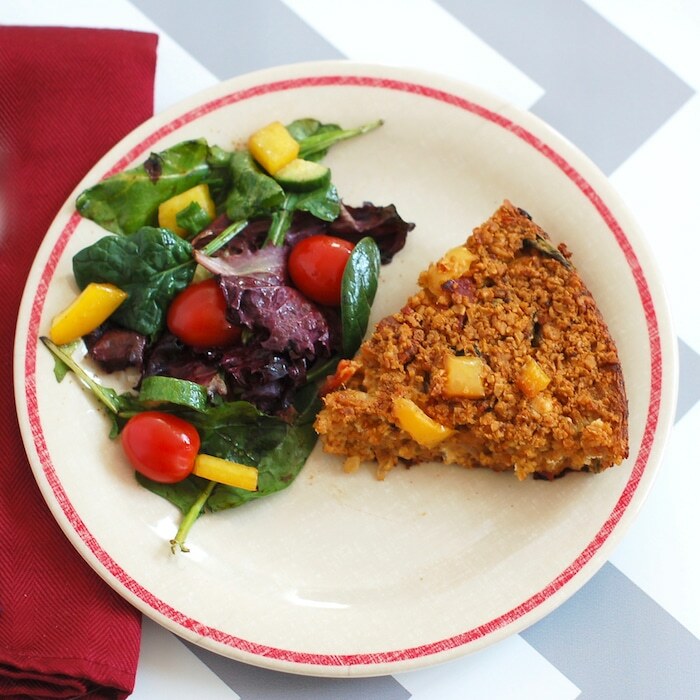 The savory baked oatmeal (which I have also called an oatmeal frittata) was such a hit that over the years it became one of my go-to weeknight recipes. It’s quick and easy to prep, doesn’t take too long to cook, and can be completely modified depending on your preferences. While my recipe below involves sautéing the veggies before adding them to the oat mixture, you can easily skip this step and fold the veggies in raw – don’t worry, they’ll cook in the oven. This will save you about 8 to 10 minutes and the extra cleanup of the sauté pan. The versatility of savory baked oatmeal, like with egg frittatas and casseroles, is one of the best parts – you can keep it interesting by varying the add-ins based on what you have on hand in the house, what’s in season, and what your family likes. While this particular recipe calls for sun-dried tomatoes, spinach, and goat cheese, a spring version with asparagus, leeks, and parmesan cheese would be delicious. In the winter you could add sweet potatoes and black beans. The possibilities are endless! In addition to the versatility of this dish, my favorite thing about baked oatmeal is the golden brown crispy top that’s formed. You certainly don’t get that from a regular bowl of oats! I hope you enjoy this recipe and give savory oatmeal a try, whether in a bowl or as a baked variation I am sure you will enjoy the twist on a classic breakfast meal! 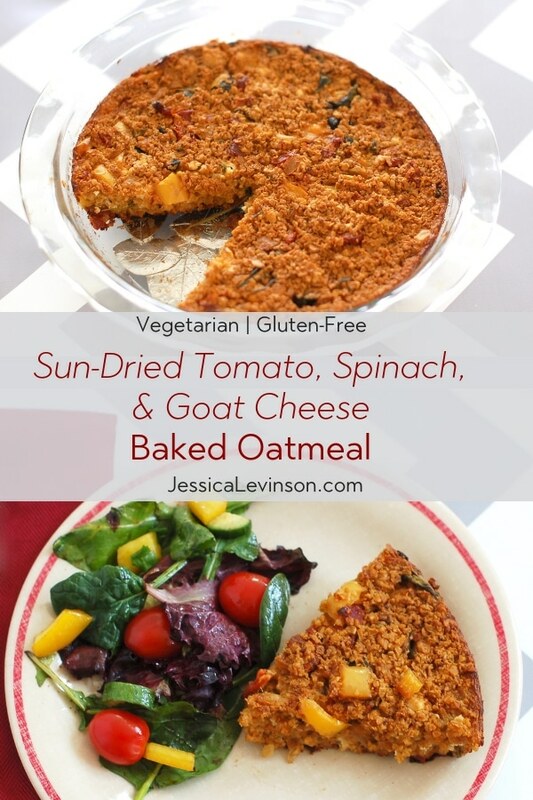 Heart-healthy oats are combined with sun-dried tomatoes, baby spinach, thyme, and creamy goat cheese in this gluten-free vegetarian savory baked oatmeal. Serve with a side salad for lunch or dinner. Preheat oven to 375° F. Spray pie dish with cooking spray and set aside. Heat a large sauté pan over medium heat. Add sun-dried tomatoes and heat until oil is released. Add onions and garlic and sauté for 2 minutes. Add peppers and cook until tender, 2 to 3 minutes. Add baby spinach, mustard, and thyme to the pan. Cook until spinach is wilted, about 3 minutes. In a large bowl, combine oats with broth or water, egg, and baking powder. Season with salt and pepper, to taste. Fold in cooked vegetables and cheese. 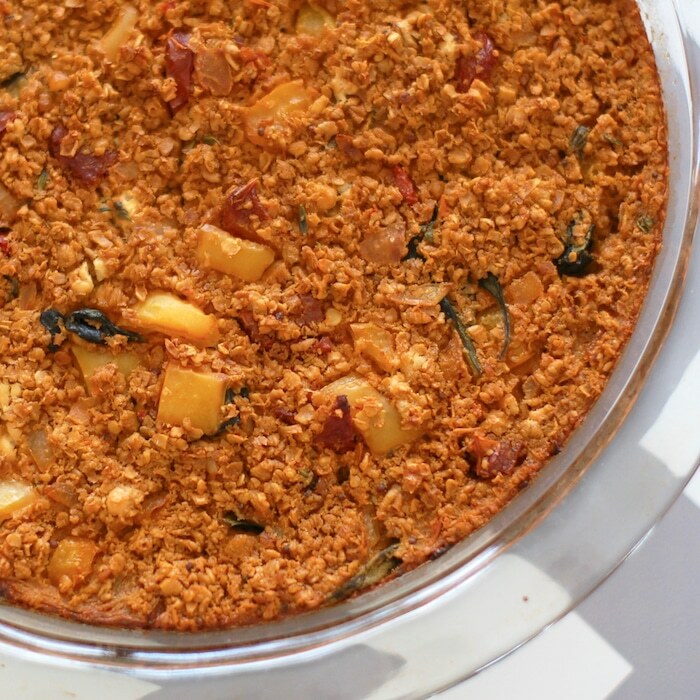 Transfer oat, vegetable, and cheese mixture to prepared pie dish. Bake for 40 minutes until top is golden-brown. Have you tried savory oats? What ingredients would you include in your savory baked oatmeal? Interesting! I would never think to put oatmeal with anything but fruit, milk, and maple syrup! Savory oatmeal is all the rage these days – you should try it! fritattas are one of my go to meals for dinner and breakfast. Goat cheese makes everything better! Have you ever tried a frittata with oatmeal? Hope you enjoy it! And yes to goat cheese! What a fun recipe! I never thought to make a frittata with oats and savory ingredients, but it’s a genius idea! Pinning and hope to try this soon! If your girls love it, I’m sure my nieces will too! Thanks my friend! It’s so yummy – hope you give it a try and please do let me know if your nieces like it too – they are so cute! It’s super popular right now and it’s such a fun and easy dinner to make. Hope you guys like it! Thanks Anne! Hope you give it a try! What a unique idea! I’ve never tried baked oatmeal before but I just might have to give this a try. The fillings you chose sound so good! Thanks so much Rosey! I love making sweet baked oatmeal too using berries and maple syrup as a sweetener. Hope you give baked oatmeal a try! i have tried savory oats + mung beans as a porridge but not for breakfast. i love the crust here with oats.. Yes, I remember that recipe! Hope you give it a try baked! I adore savory oats, and this is so creative!! Love this idea. I could see making a pan, and saving leftovers for breakfast the next few days. Can’t wait to try it out! Yes! A perfect recipe for leftovers! What an interesting idea! Can’t wait to try this one, I love savory oats. Thanks Alex! Hope you enjoy it! It’s really delicious Ilka! Hope you like it! I love savory oats. This sounds delicious Jessica. Can’t wait to try it. Thanks so much Jill! Hope you enjoy it! What a delicious idea!! I have to try this, some of my favorite flavors! Thanks Lauren! Hope you like it and the family does too! I love frittatas so I definitely need to try this! What a great idea! Thanks Kristy! Would love to know how you like it! Savory oats? I’m all in!! I love the flavors you have going on in here and your photos are gorgeous!! I love seeing someone doing something new and creative. I will have to try this wonderful idea! Thanks so much Natalie! Hope you enjoy it! I’m SO excited to make this recipe Jessica! My kids and I love sweet baked oatmeal, but we’ve never tried savory before. Fabulous idea!! Thanks so much EA! Can’t wait to hear how you all enjoy it. Please do let me know! What a delicious flavor combination. I’m usually a brown sugar and cinnamon type oatmeal girl … but this is drawing me into the idea of trying savory flavors. Thanks so much Noel. I hope you’ll give it a try! Savory oatmeal! I am intrigued by the idea. I can’t imagine how it would taste. Guess that means I need to make this recipe for myself to find out. Many people have expressed it seems odd to them, but I promise it is soo good! Hope you give it a try! Baked oatmeal is always such a hit at mine, but I’ve yet to give savory a spin. This looks pretty amazing! 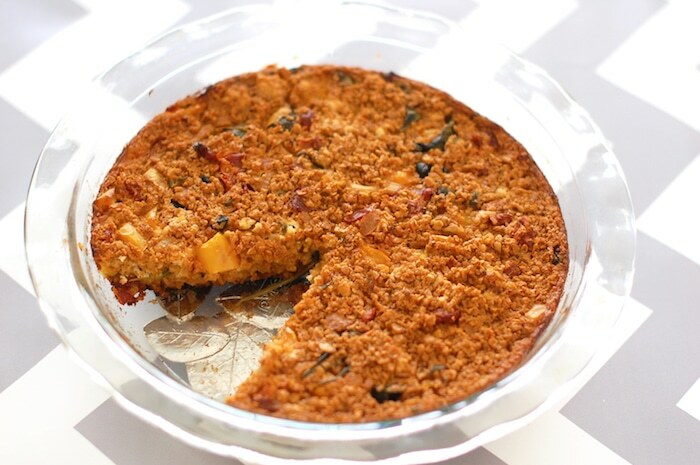 Hope you’ll give the savory baked oatmeal a try Shinta! Please let me know if you do! I’ve never tried a savory oatmeal, but you’ve convinced me that I need to! This sounds delicious! Yay! Can’t wait to hear how you like it Pam! You had me at sun-dried tomatoes and goat cheese! I love that is is a savory oatmeal – delicious! Such a delish combo, right?! Enjoy Lauren! I never would have thought that you could use oatmeal for anything other than breakfast and dessert! This is a great idea! Thanks Krissy! It’s definitely not the traditional use of oatmeal, but it’s really delicious! I’ve never tried a savory oatmeal but this looks really, really yummy! Thanks Emily. I hope you give it a try. I love doing the savory baked oatmeal b/c it’s more like a frittata, so tends to go over well with the kids. But Savory Oatmeal Bowls are also yummy!